When it comes to the club's lack of action on the transfer front, one Arsenal fan once described Wenger's position as being like someone in an unhappy marriage: they might not be able to comment about what's really going on. I don't know how much I buy into that theory, as Wenger's been at Arsenal long enough to be described as 'part of the furniture'. Surely, furniture dictates the look of the boardroom somewhat! 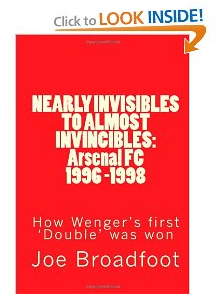 And yet, when I looked at Arsenal's buying history pre-Wenger it seems to be feast or famine. To us fans, it seems like mostly famine, but we've brought in big names every now and then. Except, there is a long pregnant pauses between 'now' and the last 'then'. When were you last excited by an Arsenal signing? Arshavin would be my answer. There were rumours that the board bought him, against Wenger's wishes. Sounds unlikely to me, but the upshot is 'once bitten twice shy.' The Bank of England club won't make the same mistake. So perhaps they won't spend big again. Much better to take small financial risks. There is still a waiting list for season tickets, trophies or no trophies. Arsenal are not called the 'Bank of England' club for nothing: that moniker is pre-Wenger. So perhaps it's not his fault at all. He's just being a loyal husband to a club that are in danger of becoming OCD. Yes, that obsessive compulsive disorder is the desire not to spend money on transfer fees. And yes, I will call it a 'disorder' until someone proves to me that refusing to strengthen the squad can result in trophies.